This easy oven roasted creamer potatoes recipe uses a mix of both red baby potatoes and yellow baby potatoes, both of the creamer potatoes variety. This roasted creamer potatoes recipe is a vegan/vegetarian side dish which you can enjoy with rice or bread for lunch or dinner. I used spices to flavor the potatoes, which you can adjust as you like. For example, I used red chili powder to make the potatoes little spicy, but you can replace the red chili powder with ground black pepper powder if you wish. I also used curry powder and garlic powder to flavor the potatoes which I highly recommend for this recipe. I used the skin of the baby potatoes in this recipe, you may peel off the skin if you wish. If you are using the peel of the potatoes, try to use fresh potatoes, as the green tinted skin will cause slight bitterness. 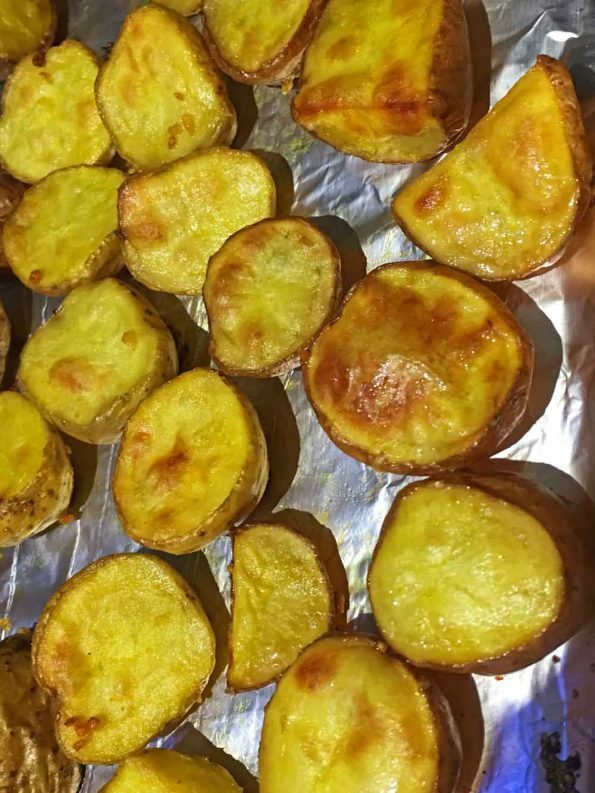 In my post on pan fried baby potatoes recipe, you can find my tips on using potato skins which will be helpful. While you bake the potatoes make sure to lay the potatoes in a single layer in the baking sheet preferably lined with aluminium foil or nonstick silicon mat which will make the baking so easy. 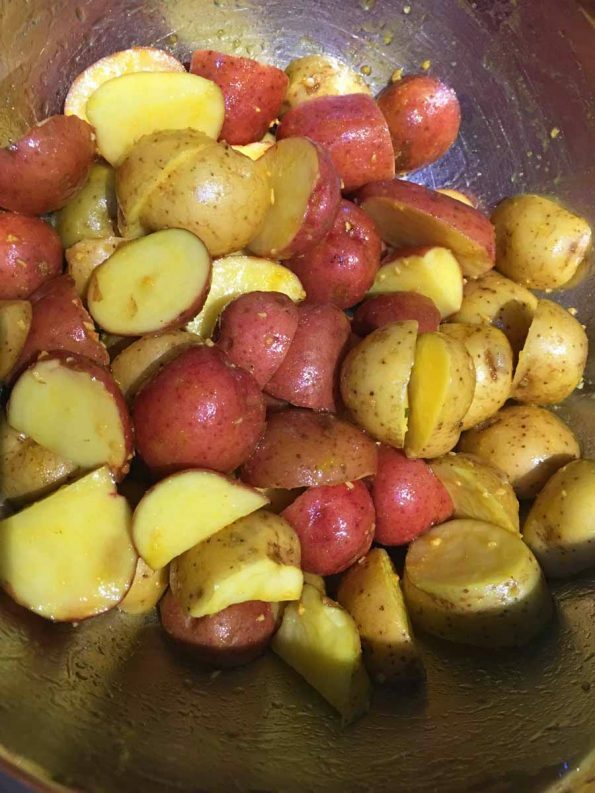 As I mentioned above I used a mix of red baby potatoes and yellow baby potatoes in this oven roasted creamer potatoes recipe. You can use either red baby potatoes or yellow baby potatoes or a mix of both as you wish. I recommend soaking the potatoes in salt water if you are using the skin of the potatoes in the recipe, for best results. 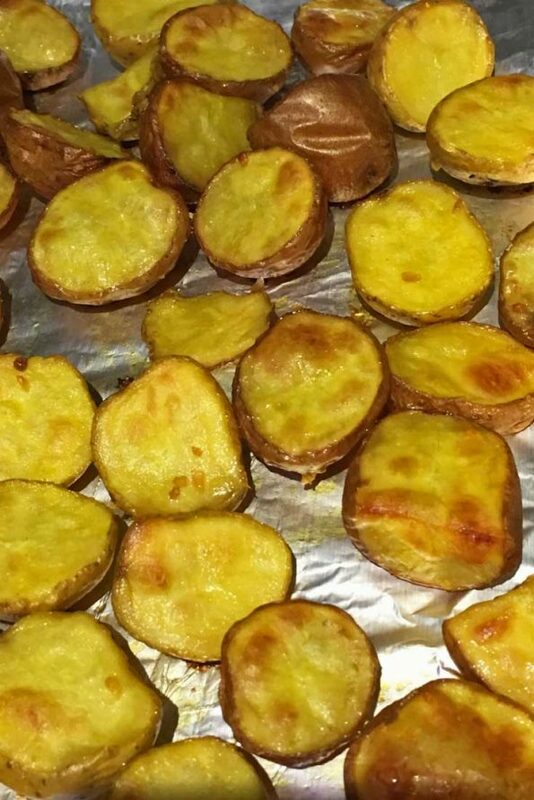 If you love roasted potatoes, see my post on this simple roasted potatoes recipe here. 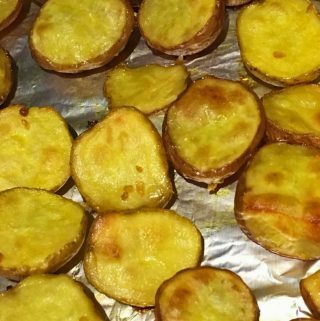 So here is how you can make this simple roasted potatoes following this oven roasted creamer potatoes recipe. Oven roasted creamer potatoes make simple and delicious side dish which can be prepared so easily. You may adjust the spices as you would prefer. Wash the baby potatoes and soak in enough water mixed with little salt. Let it sit for about 10 minutes. After 10 minutes of soaking in salt water, rub the potatoes to get rid of any dirt, discard the water used for soaking and rinse the potatoes again in fresh water until clean. Slice the potatoes in medium sized pieces evenly. Transfer the sliced potatoes to a large bowl. Add the salt, garlic powder and oil to the potatoes in the bowl, mix everything well with hands to combine all ingredients well. Add the remaining spices to the bowl - turmeric powder, red chili powder and curry powder and mix all ingredients again to coat with the sliced potatoes. Let the potatoes sit there for about 15 minutes to marinate. Preheat the oven to 400 degree Fahrenheit. 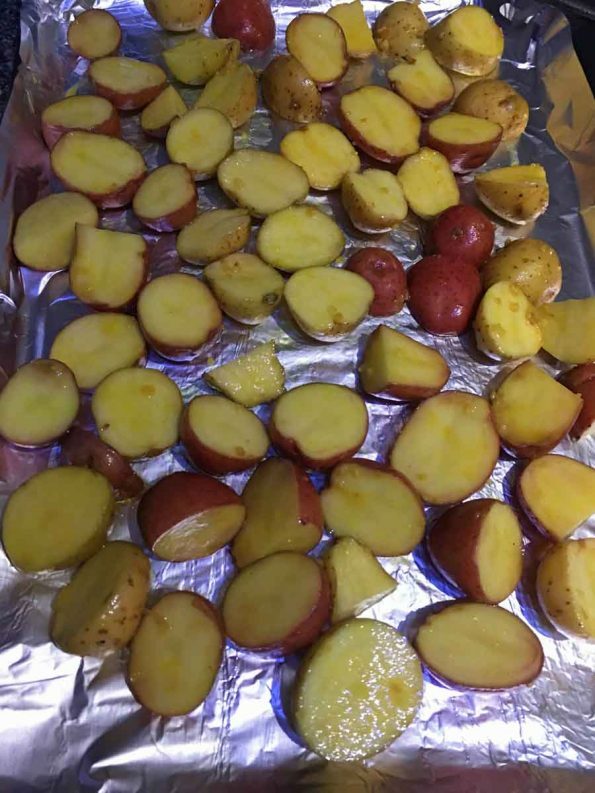 After 15 minutes of marination, line a baking sheet with aluminium foil or nonstick silicon mat and transfer the potatoes to the lined baking sheet in a single layer. 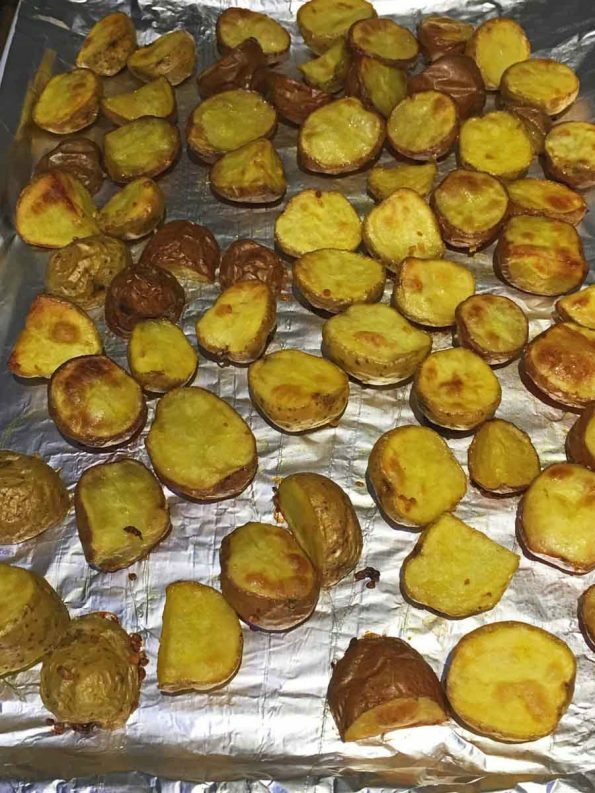 It is important not to overcrowd the baking sheet, if there are more potatoes to be baked, you can always do in multiple batches. Bake for 40 minutes or until the potatoes appears golden brown. You may gently flip the potatoes (after about 35 minutes of baking) using a spatula and bake the other side for about 5 to 10 minutes if needed. Serve the delicious oven roasted potatoes with rice or bread for lunch or dinner! 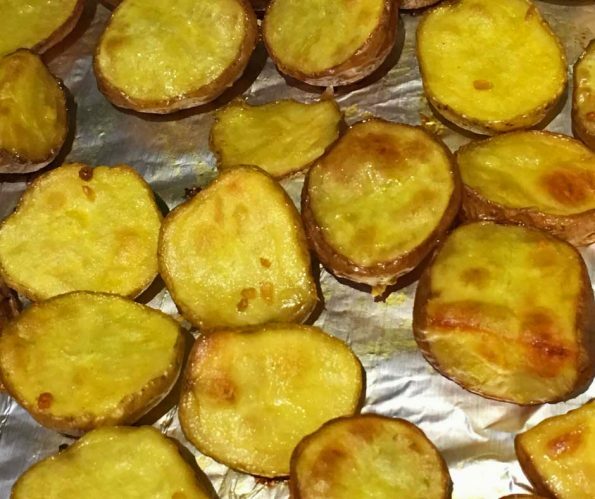 Hope you found this post on oven roasted creamer potatoes recipe helpful!